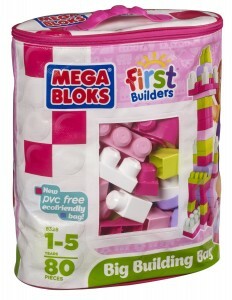 You can pick up some fun Mega Bloks (80 pc. Pink Big Building Bag) for $15.08 (reg. $19.99) right now on Amazon! Your little lady will love these girl-themed building blocks – and you’ll love the sturdy reusable storage bag too. Don’t miss out on the Lego Minecraft Sets for your older children too!